Unusual bicycles create wonder and puzzlement in many forms. The jokers are always quick with a pithy remark like "Don't fall off!" or "What's the weather like up there?" The simply dumbfounded ones tend to blurt out comments such as "Wow, that's a tall bike!" or "What's that for?" Then comes the more considered or curious questions like "Did you make that yourself?" or "How long did it take you to make it?" Of course the perennial favourite is "How do you get on that thing?" or "How do you get down?" Whilst I don't want to sabotage any mild semblences of mystique that might remain in this project I thought that I would share with you guys a little bit of a demonstration of the technique of mounting and dismounting a tall bike. 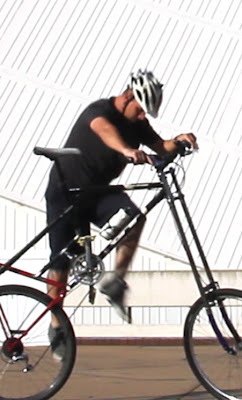 Jimmy's Tall Bike Adventures - How to get on and off from James Dodd on Vimeo.